Published in Management Accountant, Journal of the Institute of Cost and Works Accountants of India. The first step in this deeper and inner approach to knowledge-management is to have a clear understanding of the nature of the instruments of knowledge. The Intelligent Will, called as Buddhi in Indian thought, is the primary instrument of knowledge. Knowledge can also be received through heart or vital intuitions, but man, in his present evolutionary status, is a mental being and therefore understanding will in the mind is the highest and most enlightened power available to him in his quest for knowledge. So the first task for a seeker of knowledge is the purification of this faculty of understanding. In our ordinary status of ignorance, this faculty of understanding is not functioning according to its dharma but involved in the action of the lower faculties like that of our physical, emotional and vital consciousness of the surface ego-personality. These lower faculties are supposed to obey the dictates of the intelligent will like a servant obeys his Master’s commands. But in our present status of ego-based desire-driven ignorance, the master very frequently or most of the times forgets his dharma and becomes an accomplice of his servants, who use him as a tool to provide rational justification to indulge in their desires. So the first step in the purification of the intelligent will is to disentangle the faculty from its involvement in the surface play of the physical and vital consciousness. The main reason for this entanglement is the very nature of our human terrestrial evolution which has progressed from matter and life to mind through a process of progressive emergence and integration. Life or vital consciousness has emerged from physical matter and was integrated into it and transformed it to become a living matter. And mind has emerged from living mater and transformed it into a living and thinking matter. Thus our mental consciousness pervades our whole being. There is a physical mind, vital or emotional mind and a thinking, willing mind. The characteristic action of the physical mind is an obsessive repetition of habitual mental notions acquired from physical sense-perception. The vision of this physical mind is confined to a life bounded with the sensory perception of the brain. The vital mind brings up an eager, restless and anxious pursuit of desire and emotional attachment into all our mental functioning. This vital mind is always ever ready to provide convenient justifications for the desires of our vital ego. Beyond this physical and vital mind is the thinking mind. Here also there are two elements in this part of mind. There is an element of pure reason, which is capable of a disinterested pursuit of truth or knowledge and can range freely in the realm of pure abstract ideas. But there is a pragmatic element in this mind, which is oriented towards life and is always interested in utilizing knowledge for application, enlargement, utility and progress in life. Though this higher part of the mind is capable of a relative freedom from desire, it is still subject to ego-sense. In the pure reason this ego-sense creates a strong intellectual attachment to certain ideas or ideals, pre-conceived notions, and an attraction towards particular forms of intellectual, aesthetic, ethical or aesthetic, ideals or pleasures. Sometimes an inordinate desire of this part of the mind for a vast accumulation of knowledge for the personal pleasure or satisfaction of the intellectual ego is mistaken as a “disinterested” pursuit of truth. In the pragmatic part of the intelligence, this ego-sense creates a strong inclination to use knowledge as a tool for personal enlargement, benefit and progress of the ego. Intelligent will, Buddhi has to be purified of all these gross and subtle traces of ego and desire¾this dark twins of ignorance are the source of all impurity¾and released from its entanglement in the functioning of other forms of energies¾physical, sensuous, vital, emotional¾of our nature. The first step in this discipline of purification is self-observation. We have to observe carefully the movements, workings, urges and natural inclinations of our physical, vital, emotional, thinking and pragmatic mind. We have to become fully conscious how our thinking intelligence is entangled with and constantly influenced by other and lower parts of the mind. And through a process of constant stepping back, detachment and disidentification, we have to slowly and patiently disentangle the thinking mind and will from the mixture and influence of the physical and vital mind. For example when we are trying to arrive at a decision, judgement or conclusion or solving a problem we must observe how our emotional and vital preferences and desires or personal self-interests enter into it and colour, distort or influence our process of thinking. Similarly, we have to observe the working of the Buddhi, the pure and highest intelligence in itself. We have to see how even our higher intelligence is subtly influenced by one-sided, fixed and preconceived mental, moral and spiritual notions which prevents it from perceiving the truth in its wholeness. The second discipline needed for the Intelligence is concentration. Concentration means the ability to focus all the attention and energy of the mind on a particular point and hold on to it as long as it is needed. We must note here that concentration does not mean we must always be tensely focused on something but to acquire and possess the ability to focus our energies at will and whenever it is needed. Our so-called “normal” conditions of mind is a state of dispersion, diffusion and wastage of the light and power of our consciousness in a multitude of thoughts, feelings and objects, scattered helplessly in an uncontrolled medley of confusion and disorder. Such a mind is the most inefficient and unproductive. For Mind is also a form of energy like Matter. When this mental energy is scattered and diffused in uncontrolled and useless chattering it is at the lowest and at the most inefficient level of functioning. On the other hand when this mental energy is under control, free from useless, wasteful and disturbing thoughts, focused and concentrated at a point, it functions at its highest potential. Energy, physical or mental, when focused, enhances its penetrative power. An apt analogy from modern technology is the Laser beam. Laser is the electromagnetic energy of sunlight¾which falls on earth in a diffused and scattered form, ¾focused into a coherent and concentrated beam, which can penetrate even steel. This applies equally to mental energy. The act of focusing the mind increases and multiplies the cognitive as well the penetrative power of its energy; it grows in light, clarity, insight, understanding and also in power, intensity, strength and force of effectuation. In fact some form of concentration is there in all creative and productive activities. All great leaders of thought and action and all those who have attained higher levels of success or excellence in whatever field, business or politics, art, literature or religion, possess this capacity of concentration in an exceptional or above average measure. But the Science of Yoga believes that even an average man can develop and enhance his power of concentration by constant, systematic and methodical practice. The power of concentration is developed by persistent will, vigilant mind and constant practice. We must keep in mind that there is no shortcut or quick-fix remedy for concentration. We have to work against the natural urge of the mind towards dispersion and impress upon it the opposite tendency of concentrated focus, through a patient, persistent and undespondent will. The steps of the process are simple in paper but difficult to put into practice. The first step is to establish a minimum amount of calm in the mind. Next step is to gather and bring back the vagabonding mind to the focal point of concentration which may be an object, thought, or an activity. Third step is to hold on to it as long as possible, keeping the distracting thoughts away with a vigilant mind and a firm will. Here comes the importance of an alert and vigilant mind. A sleepy and drowsy condition is a great obstacle to concentration. And sometimes a drowsy absorption of the mind in an object is mistaken for concentration. For effective concentration, both the will and awareness in the mind has to be alert, watchful and vigilant to ward off the unwanted intruders and keep the mind focused. But the most important discipline in perfecting the instruments of knowledge is the silencing of the mind. A settled immutable peace, silence and tranquility in the mind is an unmistakable sign that a perfect purity is established in our mental consciousness. And only in an utter silence the knowledge of deeper truth of life and things can be heard without any distorting interference. There is a higher intuitive understanding beyond the intellectual understanding of the thinking mind. This intuitive understanding has a direct insight into the deeper truth of things bypassing logic and reason. But to awaken this intuitional intelligence, the intellectual understanding has to be stilled and learn to receive the higher intuition in a receptive silence. Many methods are suggested in Indian yoga to establish this silence in our mind. One way is to allow the thoughts of the mind to raise and play and dance as it pleases while one part of the mind takes the poise of the detached, non-interfering witness. Gradually, the thought-process slows down and at a certain stage comes to a standstill. The other way which can be very effective for those who has a certain capacity of inner vision in the mind is to see the incoming thoughts as they try to enter into our mind, and throw them away with our will before they can enter and settle into our mind. When this discipline is persistently put into practice, mind is emptied of its contents and becomes silent. Third way is to visualize the all-pervading immobile silence of the spirit penetrating everywhere the ether of space and try to relax our mind into this silence. The fourth way is to allow the thinking mind itself to arrive at the understanding that thought cannot know the truth by a choiceless and unbiased self-observation of our thinking process or by intuitive thinking. If the reasoning mind can be made to understand clearly the inherent contradictions involved in the logical thinking process which can trumpet arguments for and against a proposition with an equally convincing felicity, then the logical thinking mind may loose confidence in itself and become silent. This peace and silence should be allowed to settle down and pervade the entire mental consciousness and remain undisturbed even in the midst of an intense mental activity. In the initial stages of the path the seeker has to become conscious, by deep meditation, of a zone of silence to which he can constantly step-back from his surface activity. But the ideal to be realized by the seeker is to live in this silence and act from this silence. 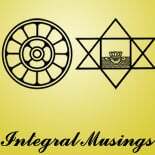 This entry was posted on January 31, 2019 by integralmusings in Integral Management.